Experience the Ultra Fast power of the Innokin Kroma-A! It'snext generation upgrade of the internationally known Kroma vaporizer!The Innokin Kroma-A is an ultra compact rapid response vaporizer with 75Watts of Temperature Control Power in an Ultra-Compact 72mm design. Enjoy amazing, full flavored clouds the way you want with the precise 6-75Watt output for the best of MTL and DTL vaping! The upgraded flush 24mm 510 connection is a perfect fit for all popular atomizers. Vape with confidence with the easy to use Temperature Control(SS316, ni200, Ti) with dry-hit protection. The Kroma-A has a real internal 2000mAh Li-Po battery with 2amp micro USB quick-charge! Always be The Kroma-A international edition includes the amazing Crios Tank! 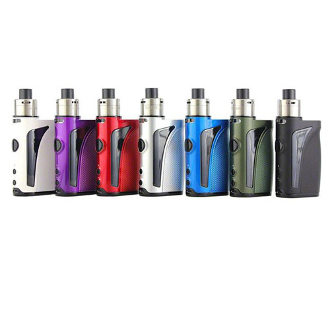 The Crios tank delivers huge flavorful clouds at 55W with an upgraded, easy to top-fill, design. Dimensions: 2-11/16" x 1-3/4" x 15/16"